So the Lakers come home for game three tonight, and one thing is pretty clear. They need your help. Badly. Show your Nicholson-level-number-one-fan love at & Still, La Brea's new sports shrine that's currently filled with one-of-a-kind goods paying homage to your team. The large shop's stock is mostly unworn vintage clothes—so the shirts, jerseys, jackets and hats aren't cheap. But worn courtside (or at your favorite flat-screen-and-pint spot), a colorful "Lakers Power" Chalk Line jacket from the '90s might provide enough Magic to help right the wrongs of games one and two in Beantown. You'll also find a sartorial tribute to former coach Pat Riley (celebrating a late-'80s three-peat that didn't quite actually happen) and, say it ain't so, Magic Johnson sharing T-shirt space with legendary rival Larry Bird (that would be for the '92 Olympics). 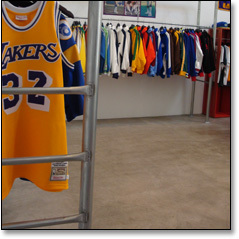 Proprietor Jeremy Shapiro has a few key finds hidden away by his desk, like Worthy's '91-'92 warmup jacket (which is going for a cool $1,200), and today he's expecting a shipment of Laker jackets that include a couple of prize black-and-purple reversible Starters. Because when you're trying to reverse a series, reversing the jacket is a pretty good start.